At last, a Japanese role-playing game on Wii that can spark thoughts of Pikmin and Psychonauts. But it's also the first game to make this mild-mannered reviewer angrily throw his controller in about a decade. Shall we thank the people who make us the most creative games, for which there isn't yet a mold? But in the midst of praising them, what should we say when their game drives us to angered frustration? These are the good and bad versions of that phenomenon of watching a movie and not being able to lose yourself in it — not being able to forget that that is an actor up there playing a role and that a camera captured that beautiful scenery. One wants to forget the human involvement and be swept away into another world, but the best and the worst of the creators' involvement keeps one from ever completely believing the illusion. That's the Little King's Story experience: the thrill that someone made this for me and the muttering that someone did this to me, a frustration that, on balance, I think I was happy to suffer. Pikmin For A King: Little King's Story is the brainchild of Yoshiro Kimura (interview about his creative ambitions here). It's a role-playing game in the sense that it has an overworld, quests to take, villages full of characters to talk to, items to gather and equip, seven wives to satisfy (T-rated, folks! ), bosses to battle and a world to save. But it's like Nintendo's Pikmin in that the hero is a king who could be a mouse cursor like Pikmin's stranded spaceman, Olimar, leading a growing pack of distinctly-enabled creatures to do most of the fighting and collecting for him. He leads a class of varied troops — woodcutters who can clear tree stumps, knights who are good in a scrap, a TV broadcaster who can clear giant TVs from the playing field and about a dozen other minion types for players to discover and recruit. For those of us who believe that Pikmin 2 is among the finest games ever made, this design is a good thing, even if Nintendo's franchise had controls that more reliably caused each minion to attack and flee more precisely. Urban Planning: From Sim City to Dark Cloud 2, games — even role-playing games — games have allowed players to construct cities where once dirt lay and grass sprouted. But Little King's Story offers a superior thrill. Its battlefields are its acres set for urban development. Imagine exploring a world as vast as a Zelda's and, after clearing out enemies in a given part of that world, setting about building fantastic villages upon it. Where once you were swarmed by angry vegetable men, by mid-game will be a boulevard in a town full of magicians or a mall set off from a farm. This instills a feeling of accomplishment to rival any earning of a master sword or mounting of an epic beast. Unexpected Personality: The Don Quixote-inspired supporting characters seen early in the game are an early clue that the personalities in this game have personality. About 10 hours deeper in, the surprise creativity becomes the norm. Mad TV stations and pompous men with beards as long as mountainsides. Angry chickens, angrier enemies riding giant vacuums and giant, spinning compasses from geometry class — they're all charming menaces. The princesses are less interesting, mere tabulators of various in-game collectathons. And the townspeople are not all that fascinating. But the characters you can fight are increasingly entertaining. As a bonus, the bosses are introduced by some of the best cut-scenes of the year, painted sequences that defy expectation and enable me to say that, sorry, Halo Wars, your cut-scene of Spartans assaulting the Covenant was cool, but not as cool as Little King's Story's cut-scene of a basket full of food being lifted up a mountain to a bearded tyrant. Seriously. LKS' scene is tops. Unexpected Gameplay: The game has not just the entertaining personality of, say, Psychonauts, but has been designed with the same brazen willingness to sample whichever gameplay style makes the next sequence funnier. Boss battles aren't just Pikmin-style minion-attacks on a giant beast. This game can also riff on Space Invaders, Pinball or set up a trivia contest which penalizes wrong answers with the assault of more angry chickens. Little surprises abound, including a subtle wedding mechanic that allows the Little King to marry his minions to each other. The game is full of unexpected elements like these. 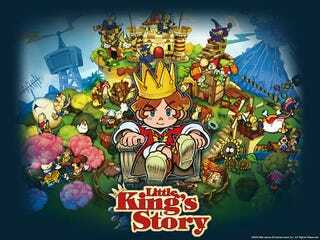 Time-Waster: No game has wasted more hours of my life than Little King's Story. And by wasted I mean: I finished the game in 23 hours and 10 minutes but probably spent another five or six more hours interspersed among those replaying a lot of that same content. Why? Because the game lacks an auto-save system and is punishing in its restarts. Among other things, it discourages saves by preventing the player from saving their game after major story moments until they manually opt out of interactive and lengthy post-boss-battle village parties. You will forget to save at least once. Guaranteed. Saves can only be made within the King's base castle. And what's worse is that the game designers appear to know they could have offered more. Boss battles, at least, offer an immediate re-try when the King is killed, though even that re-try often requires the re-playing of 10-30 minutes of game that can be completed safely before the tricky moments are again reached. This is what had me throwing my controller, the sheer anger of how many times the sometimes-spotty controls and often-atrocious save system forced me to re-play long stretches of the game. Can you have too much of a good thing? Yes. Because a good thing isn't a good thing when it's being experienced the fifth time in a row. Item-Mismanagement: The preceding problem is exacerbated by the game's disappointing item management system. As the Pikmin do, the Little King's royal guard will die. And they'll die a lot in big battles even when they fight 30-strong. These guys will often be resurrected on the next in-game day, but they will return without any of the weapons or armor the player assigned them. The game forces the player to manually re-arm the characters, which can take a good five minutes. Given the amount of times this can be necessary following tough battles of a game that isn't that easy, all this item management becomes a hateful chore. It's hard to harbor too much venom for a game that hides a silly ping-pong mini-game in one corner and has a school building that automatically turns any tree-climbing children in your party who you send through its doorway into adults (Yes, isn't that what all schools do?). It's hard to knock a Wii game bold enough not to use any motion control and bolder enough to make fun of its own depiction of G-rated polygamy. It's hard to hold much against a development team who are always top-of-mind for any player who, weary of so much video game cliché, keeps finding things that aren't cliché here. But it is maddening that games can be made that feel they haven't been played. Didn't they know some of this would be so annoying? Didn't they care? Little King's Story is a wonderful Wii delight, but it will draw some blood. Be warned. You'll smile. But it'll make you mad too.